I decided that its time to do a bit more work on my ACW armies. Its been nearly 2 years since I merged my own troops with the Volunteers and based up nearly 40 x 20 man regiments but there it stopped. They have seen action several times since then but the organization above regimental level remains adhoc, there is a shortage of flags and brigadiers and the bases aren't labelled yet so I have to rely largely on identifying painting styles and groups of poses when sorting troops in and out of their boxes, not to mention the still disorganized cavalry and artillery and the remaining scores of painted infantry and hundreds of unpainted ones. I decided to start with a distinctive "army command stand" aka division commander for each side. These will be round with a group of officers on foot with a mounted one (Confederates) or a horse and horseholder (Federals) to make them easy to distinguish. I had sufficient painted Rebs but had to convert a few Yanks and these are now primed and ready for painting. 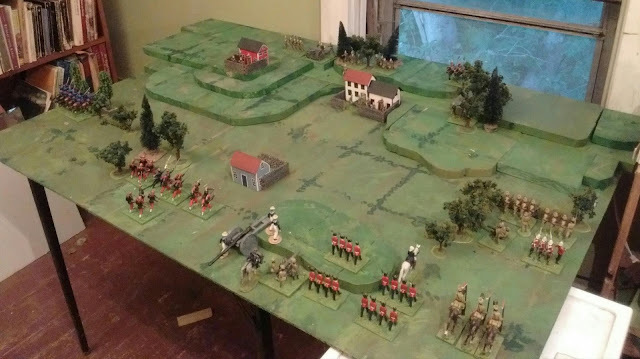 Saturday's Atlantic Simulation Society informal partial reunion game using Lentulus' 10mm 18thC armies and Hearts of Tin was a great success but as I expected, over 3 hours of actual playing time was no where near long enough to reach a conclusion beyond having fun. More games are in the offing and I'll post a link to Lentulus' game report when it appears . 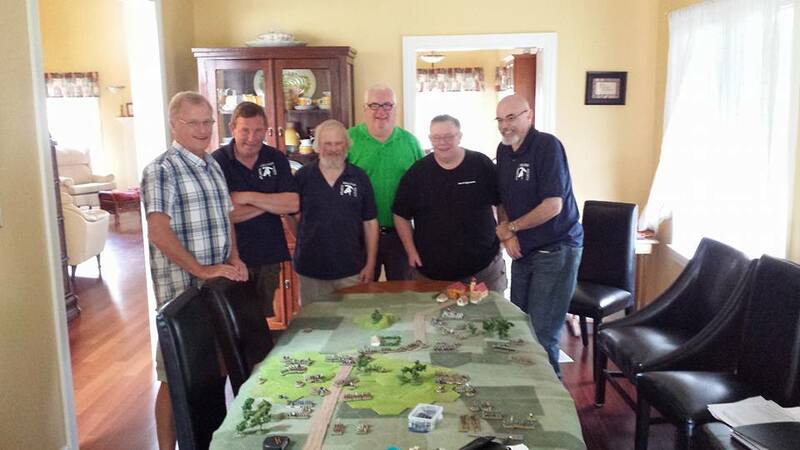 It was in 1979 when I moved to Halifax and started socializing and gaming with these guys. We haven't changed all that much really. 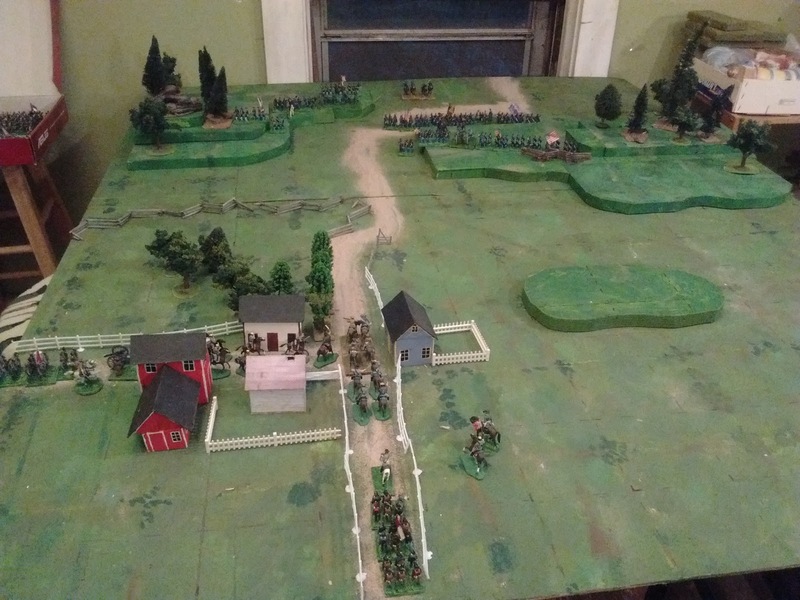 On Sunday, I replayed Friday's scenario on a smaller table using a version of The Tin Army, modified for the ACW with generic regiments as units. 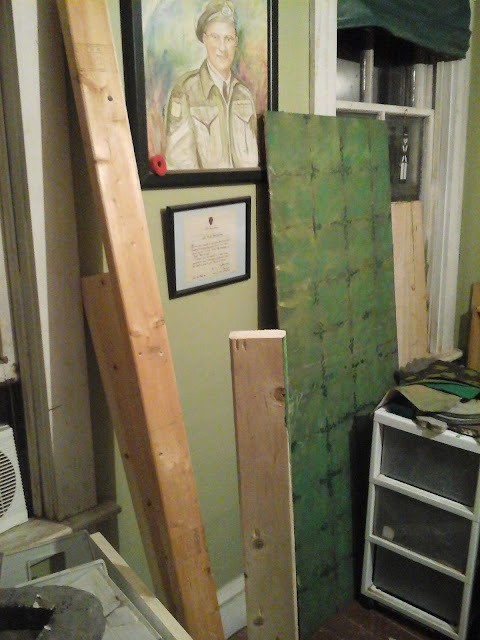 I walled off 8" on the far side and ignored the first rows on the left to give me a 10 x 14 grid of 4" squares. Worked like a charm. My goal is to be able to play most of these scenarios solo and finish in between 1 and 2 hours depending on size and complexity. At times this game felt almost too sudden and bloody but this medium sized scenario still took about 1.5 hours to play 12 turns to a Condeferate win which was about right time and effort wise so it seems to be fast, simple and deadly rules or leave 1/2 the painted figures in the box. Here us the same scenarios and armies as in the previous game but with 8" chopped off both length and width. I didn't miss them. As anticipated, much less time was wasted walking around the table and hunting for things. Since 80% of the moving and fighting was on the far side of the board and I had to reach over a wooded hill, I still spent much of the gaming standing, bent over the table, but apart from not being a big deal at this point in my life, that could have been avoided by laying out the scenario in the other direction. More importantly the frustration levels were cut by 90% since the few markers I needed were at hand and remained there as did the dice while the casualties were all collected on one easy to reach shelf easing post game packing up. Definitely the way to go for me. I might try a skirmishy, single figure sort of game for scenario 4 but that's a decision for next week. I'll post the ACW rules and discuss them later this week. The good news is that Hearts of Tin still does what it was designed for and I don't foresee any major problems with Saturday's multi-player game and that the 4'x5' table had plenty of room and could easily have accomodated two people sitting facing each other. General Kinch puffs on his pipe as he dictates orders for the attack. The inevitable bad news is that after more than 2 hours of running back and forth around the table, often several times per turn as I moved troops, chased the tape measure, hunted for more markers, move casualties from the corner of a table to a regrouping area off table, etc (all good exercise for me! ), and after throwing seemingly endless handfuls of dice, few of which were decisive (though several could have been if the roll was different), and placing and replacing endless marker dice, I was hot and both physically and mentally worn out. Without the uplifting energy of competion, the finish was met with almost as much relief that it was nearly over as excitement as to whether either side could manage a win. I was especially interested to confirm that the business of tracking hits and removing stands with its attendant direct, drastic drop in effectiveness and frontage just doesn't work for me any more , at least not in a solo context. Leaving aside some theoretical qualms, the practical business of bringing troops out and then quickly stuffing casualties here and there to be sorted later as I try to keep the action rolling. Not bad with a dozen stands but with 40 to 50 stands being removed over 18 turns, they can get a bit mixed or lost. But on to the game! About 6 turns in. The Reb cavalry has been sent to probe and "amuse" the Yankee left. They do so well enough to draw in some reserves but are maybe a bit too aggressive with their dismounted attack and also suffer heavy casualties. The infantry soon catches up and the attack is pressed all along the line but is held. Across the road a desperate stand by a 20th Maine Wannabe repulses a series of attacks by total of 4 Reb regiments before the last strength point is ordered to fall back in good order. It almost makes it to safety but is overwhelmed by concentrated long range artillery and musketry as it nears safety. It has, however, cost the Rebs precious time. An overview around turn 12 of 18. Everywhere the Federal line is under pressure. The Rebs have lost almost twice as many stands but they have more to lose and by replacing worn units with fresh ones, have yet to lose a regiment. 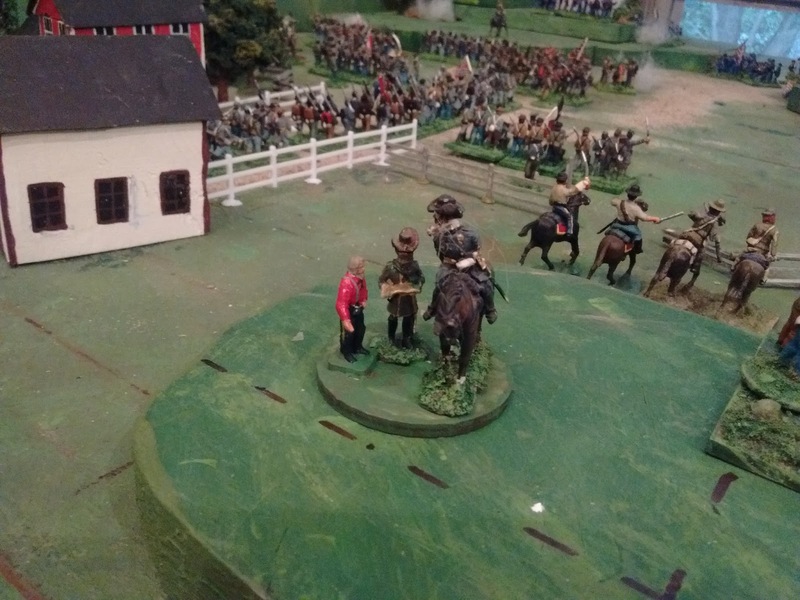 The Union commander, either misunderstanding his orders or else losing hope of victory and opting to go for a draw, has ordered his men to give up the ridge and slowly fall back as the sun sinks towards the west. Time grows short! Kinch's orders are to have a substantial force break through and exit the battlefield before dark. Only 4 turns remain. The enemy regiments have suffered heavy losses. A mounted cavalry charge is sent in in hopes of breaking through. They face the steadiest volley of the day and are mown down. There is no stopping the Rebs now though. Charge follows charge interspersed with the fire of 4 batteries which have come forward. Regiment after regiment of Yankees breaks and streams to the rear but as darkness descends not a single Reb regiment has broken through. Kinch calls a halt. His division will camp on the vital gap and pursue in the morning. A tactical victory but a strategic (and scenario) draw. The board is now reset to the proposed 40" x 56" table with the excess blocked off. A replay of the scenario using in Army or Square Brigadier is now scheduled for Sunday or Monday if all goes well. But first, 10mm Hearts of Tin tomorrow! Time for a break. I took 10 minutes and laid the 4" grid on the table, laid out the terrain, chose armies that would fit the grid and then........decided not to use it for this game! 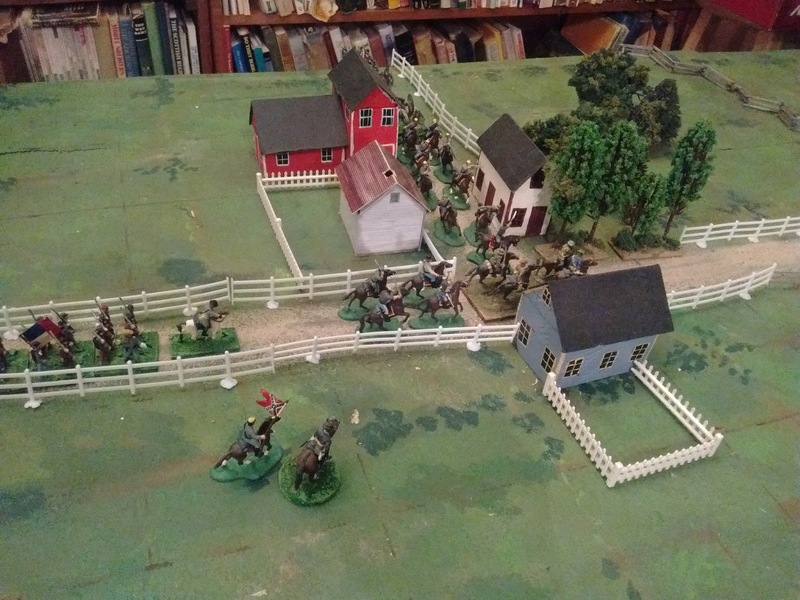 To be fair, I'm going to be playing 10mm SYW Hearts of Tin on Saturday so figured an ACW HofT game might be a good refresher not to mention a test of a few tweaked rules. Since I seem to be working my way through Scenarios for Wargames I figured I might as well go through and play them all in sequence. There are actually a few I have never played in the 30+ years that I've had the book so its about time. This one is #3. So briefly, the 1st Division of the Army of the Avon, 3 brigades strong reinforced by a regiment of cavalry and 4 guns is blocking the road North. 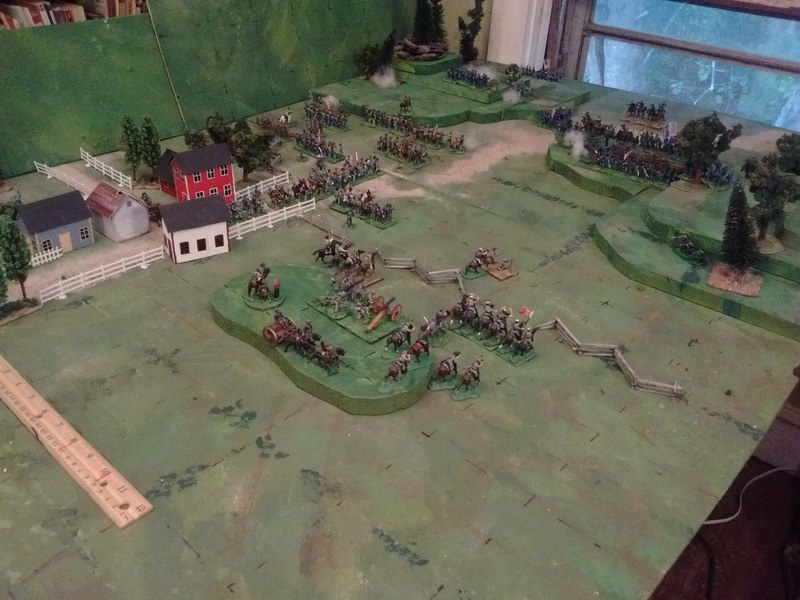 Kinch's Division of the Army of Acadia is pressing forward in haste with 4 brigades of infantry, a brigade of cavalry and 4 guns. Their orders are to take the pass and move on before dark. Game tomorrow if all goes well, otherwise my practice game will follow the live one. When I drew my initial floorplan for this room reorganization I included a wargame table with the short end against the window so that 2 opponents could face each other across the table. When I started moving furniture around I found that the result didn't "feel" right so the next version had the gamer facing the wall. Yesterday it occurred to me that I had changed not only the positions of various things, I also changed some of the pieces and that the first table idea might work and with a larger small table than was originally proposed. 25mm OS Medieval Fantasy game. More pictures and comments on Gathering of Hosts Blog. After long mental gymnastics over ratios and arm lengths I tried this improvised 40" x 56" table (10 x 14 x 4" squares if it were gridded). It felt a little narrow until I started playing and realized that with the 2/3 scale down I was using my medieval armies were 2 bow shots apart at the start. A very reasonable distance. The gridded version would have the same number of squares as the 5'x6' table I just tore down, just 4" rather than 6" ones. As the game progressed I found the table size more than adequate for the game but found it hard to reach across. The oversize cloth was even more annoying than usual and I really missed my under table shelves. The main thing though was that the size and orientation fit without getting in the way or feeling awkward. After the game I pulled off the cloth and the various bits propped up to hold the shape, raised the height then laid my 2 main boards down to be measured for trimming. While I was marking them it occurred to me that due to other changes, their 4'x5' layout was no longer as much in the way as it was when I tested one a week ago. So I am going to leave it in place for a week or so. If it doesn't get in my way I'll make it permanent otherwise I'll trim it to the size in the picture. So not a big table or the small card table size I had in mind but a medium size that I've used successfully before for a wide range of games. Might be the size that's juuuust right! I've been having trouble deciding on the best grid and table size for my proposed new table but yesterday it finally occurred to me that I had once again made the often fatal error of skipping over the fundamental question of why I wanted to have two tables and exactly what I was going to use each for and had proceeded straight with wrestling with the detail's of how I was going to handle various details such as which armies would fit on which size of grid without rebasing and whether this or that scenario would work if the grid was this size or the table that size. 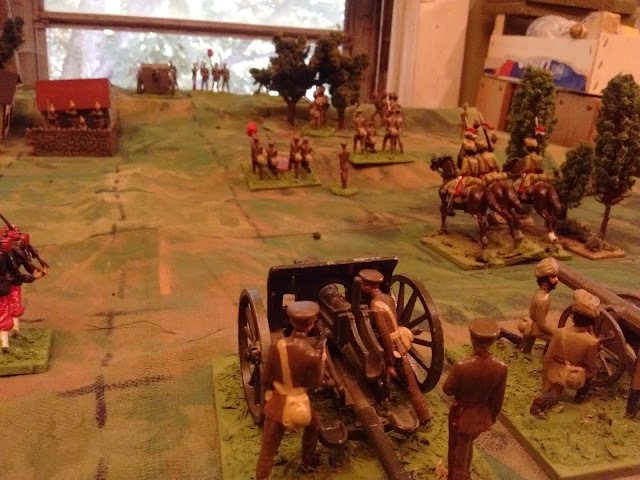 The particular question I was pondering was whether my Late 19thC/Early 20thC 40mm units should be 1 stand or 2, whether I should be aiming rules and units/grids towards 1 game unit = 1 scenario unit or 2 and so on. If it was 1 stand per scenario unit then my WWI "armies" are nearly complete but if it was 2 per unit as originally planned then I needed to double the shelf space allocation on the already full shelf. Then I asked what if I want to put this game on the big table? Will I need to double the forces again? Oh....What was the plan again? I decided that before I waste more time wrestling the Detail Alligators before me, I should go figure out what it is I really want to do with the Swamp. General's Eye view of the current game at the midpoint. 1. Why do I want a small table? This is fairly easy to answer. I could fit a bigger permanent table, say 5x4 or 6x4, that could be made to suffice for all my needs but it would be constantly in my way and I am tired of squeezing around and bumping into things, tired of overflowing cupboards and tired of the resulting clutter. I know a smaller table, well designed to fit a particular selection of games, can keep me amused and allow scope for indulging in a series of small "armies". 2. Why do I want a bigger table as well and how often would I use it? This one is harder. I suspect part of the answer is "Because" or " I expect it", neither of which are good answers really. Other answers include "In case I ever find myself hosting a game for 3 or 4 players again," Which is valid even though it has been about 6 years since the last time I hosted a multi-player game and about 4 since the last 2 player game. A 2 player game could easily be played on the small table though, if it rolls out to make room on each side and I have played in multiplayer games, just not hosted them at my house. The final reasons are to play a larger, more complex game or to test a convention game to be played on 6x5 or bigger table. Based on how life is shaping up at the moment, I suspect the answer is maybe once or twice a year or less. 3. Would a bigger game be an upsized version of a small game or something different and does the grid on the small table need to be matched on the bigger table? This is actually a key question. If I am going to expect some or all of the games played on the small table to have Big Table versions then will they all need Big Table sized armies or can I use small armies on the big table for a game with more elbow space or can I have some armies designed for the bigger table but able to be used in part on the small one and others that only have small table versions? Repeatedly over the last few years I have found myself wanting to do some small pairs of "armies" so having these and the small table designed to fit each other would be ideal. While I have various armies that are organized for and usually appear on a larger table, most of them actually appear as conglomerates of various armies lumped together so as to fill the table. 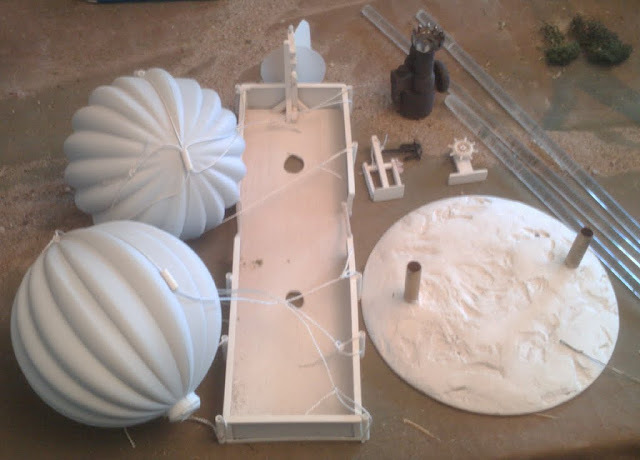 Unless the game and rules on the the big table are going to be significantly different from the game and rules used on the small table, I might get more enjoyment from actually finishing up some of the small ones and getting around to long delayed terrain building. It would be good if the expanded table was designed as an extension of the smaller one with the same grid so that the same rules and terrain could be used on bother tables. 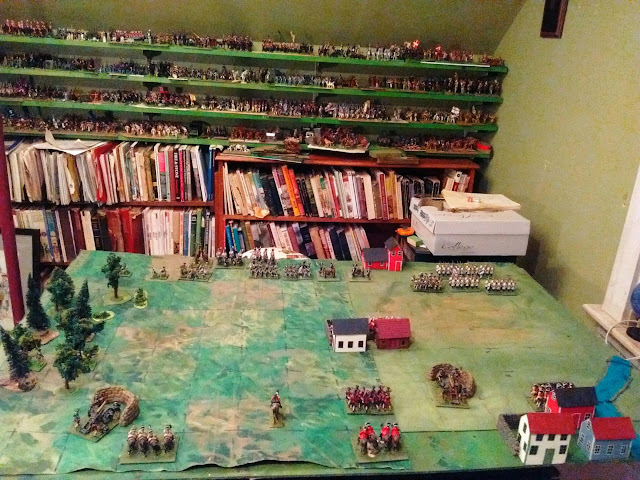 In this case, since the large table will be less than double the small one, the extra space could be used for scenarios requiring more space rather than more troops. The option to ignore the grid or cover it with a cloth would still exist. Based on this, the best course seems to be to let the bigger table go for now and focus on the best possible set up of troops, rules and terrain for the small table. I have enough "stuff" squirrelled away to be able to improvise an ungridded cloth covered 6'x4' table in under an hour if needs be, all set to play Charge!, MacDuff, Rough Woing or Gathering of Hosts. A matching permanent expansion/storage unit on wheels or "lay on top board" could follow. As for that smaller game, good progress is being made on the WW1/Colonial front but this post is over long already so I'll save that for another day. I had almost forgotten how hot it gets upstairs when the temperature outside gets to be 30C and more, but one must suffer for, well you know. Scenario 2 set up on a 6" grid subdivided into 3" squares, sometimes visibly. At any rate, I am making progress. After 2 false starts I have a workable arrangement of space and furniture, just the tidying and details to finish up. Today I turned my focus onto the hobby aspect, in particular the table. There were 2 main questions when I started: "What size of table?" and "What size grid?”. As I mucked about trying various jury rigged boards it occurred to me that I also needed to decide a question that has been in the back of my mind for a while: ”More units or bigger units?". I had been leaning towards bigger units, hence the move from 4" grid to the 6" one. That hadn't worked too well as it tended to look like there should be more detail and more depth to the units otherwise it was the same game, just less convenient without being more esthetically pleasing since the units were still too small. Unit and base size as well as terrain, especially buildings, are all factors. After various experimenting and testing, the easiest solution also appears optimum so I am going to go with a 3" grid with a non-gridded or different grid cloth over the top when called for. The main downside is that I need to bite the bullet and make the new 3" grid friendly buildings that I've been putting off for a couple of years. That just left the size of table. 36” deep is comfortable but 48" too deep for me to reach across. 60" is the most I can squeeze in without getting in the way when not in use and 48" is the minimum I will accept. Keeping the possibility of a double 3"/6" grid I decided to split the difference and go with 42" x54". It'll just be boards on a card table for now but this fall I'll work on a permanent table on casters with undertable storage that can be rolled when I have company so we can sit facing each other. Nope. Of course I did take Thursday off to go to Halifax to play a game of Colonial Battlecry. Ron's Ral Partha and Minifig Troops apart from a few of my old RAFM and Frontier mounted officers from our early 1990's games when the units were 20 strong. As so often I was too absorbed in the game that I forgot to haul out my phone to take a shot until after I'd been forced to give up the effort to break through his Hasty Blocking Position. I am very slowly getting my room back into order but having had to move my painting light a few weeks ago without having my old desk upstairs ready to go again yet, I finding that I am getting impatient at not being able to sit and paint when I get the itch. Should have that fixed my Monday if not sooner. In the meantime I did make time to play that test game so I could move the table out of the way to gain manoeuvring room. Since I was using my first metal wargame figures (30mm from 1973), and it was the first game on 1 10 x 14 grid of 9cm squares, I decided to play the first scenario from CS Grant's first book of Wargame Scenarios. A narrow squeaker of a win for my British over a programmed French attack and a good time was had my me. I'm about halfway through reorganizing my room but had to pause to try to assess whether or not the proposed 3x4ish permanent mini wargame table will prove acceptable in the long run. (Actually 10x14 9cm squares to match the 5x7 layout used in many of the Asquith and Grant scenarios at 1 sq=6" on a full size table or 1cm on the map. I wasn't expecting anthing negative since I have fond memories of past card table games but at the same time I didn't anticipate the intense feeling of pleasure, anticipation and of "coming home" or meeting a long absent friend when I sat down and started to lay out troops on the small board. Perhaps I've been affected by all the enthusiastic endorsements for Thomas's One Hour Wargames or am just getting lazy but I think there are 3 threads coming together, threads that I have previously noted individually but not fully tied together. One obvious one is the benefit of having a game that is quick and easy to set up and play, especially if long chunks of personal free time are scarce. 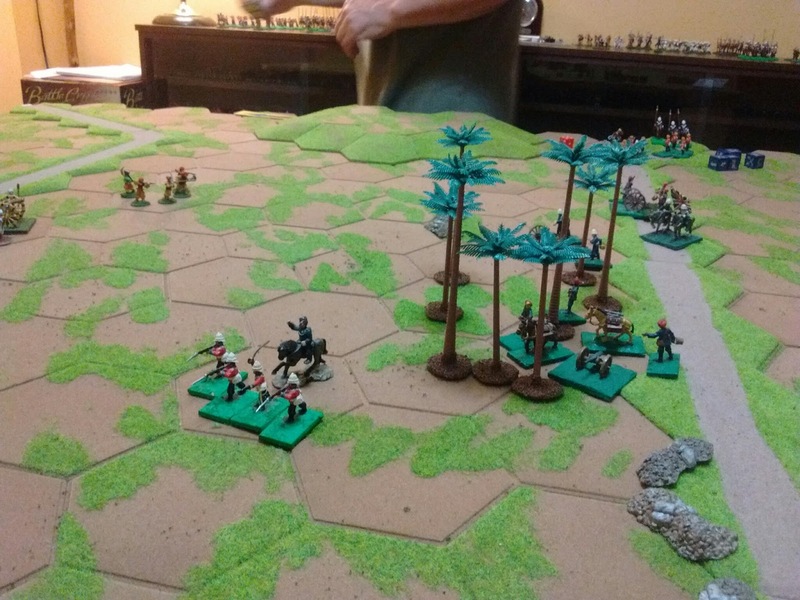 Recently I have found myself setting up a game one weekend to be played the next and sometimes playing several games on the same terrain to avoid the full takedown and set up. 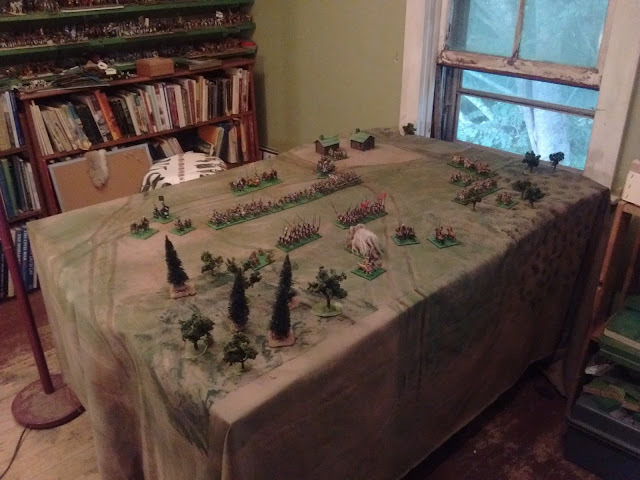 There is some advantage in set up time with any small board where you don't have to circle the board with handfuls of trees and so on as well as having a grid so you can translate a map easily, but its easy to imagine having terrain tiles, woods, towns etc, based to fit the grid and accomodate troops. I suspect that it is no coincidence that the frequency of games decreased after I put away my portable game. The second one is a more recent thing first noticed two or three years ago. It is the growing desire to have a solo game which is a game, me vs the system and able to win or lose rather than left hand vs right. Its possible to do this on a larger nongridded game (like the last one) but its somehow easier on a small gridded board, perhaps because options are more clearly defined or that it is more obviously a game. Lastly there is some sort of emotional connection with the cardtable games that I still haven't completely identified. Perhaps its the resemblance of a game like this to those childhood Marx Miniature Masterpiece play sets with their play mat, terrain and painted figures? In any event, this week, I have been getting as much or more pleasure contemplating a future where I have a score of "playsets" with shiny toy soldiers and matching terrain which can be selected according to my mood and quickly deployed onto the table when the mood strikes or for a mini campaign on a holiday weekend, as I ever did over the last 45 years imagining a day when I would have a big table with ample 1st class terrain and huge forces of well detailed, historically correct miniatures. Of course what I have at the moment is an unholy mess and a lot of work to do but tomorrow is forecast to be rainy and I suspect I'll get a chance to play a quick game. After all, a gamesroom set up is never tested until a game has been played! All quiet on the gaming and painting front, apart from the sounds of demolition. This all means a better place to paint and areas to store inventory, packing space etc, so.......... Time to rearrange and downsize the game table again. I've been finding less enthusiasm for chasing a few hundred soldiers around a chest high table and thinking back to some great portable games anyway so I may go as low as 3'x4' or as large as 4'x5' which has worked well in the past but there certainly needs to be some thought about future games and about compact, easy to store, multipurpose terrain. Lots of shuffling of things and organizing to do but I am determined to have a re-inaugural game later this week. Follow Up Edition: War by Sea, Air and Land! "As we descended a shot rang out..."
We have a new report for the Newaussie Expedition from Lt. V______ of the Faraway Trading Company Aeronautical Service. "In all my years with the FTC Air Service we have never tried carrying troops into battle before. It wasn't easy but by gathering every balloon and stripping them down we managed to cram 2 platoons of Riflemen on board our small flotilla. Luckily the balloons had first been introduced to carry a fair cargo of supplies as they went from trading post to trading post so the baskets were larger than normal. The wind generally was light from the West which could have been a problem but we took off early and were able to catch a good onshore breeze which carried us right up to and around in behind the battery though we had to stay low to get the best effect. The vegetation was pretty thick but we caught glimpses of movement down near the native huts. It was a bit of shock as we started our descent to see a puff of smoke followed by the report of a musket. Evidently a long rifle and well aimed as the basket was soon riddled and several men wounded. We quickened our descent but as we neared the ground there was Boom from beyond the river and a cannon ball whistled past our ears. Soon we were on the ground and the Riflemen struggled to get clear while shot plowed through their ranks. As we fired our burners and started to rise again, I looked across at our sister ship and saw it swarmed by savages and 2 of their white spiritual advisers who seemed intent on smiting us harder than one would expect from men of God but its not the first time they have taken up arms against the Queen." A fierce struggle around the balloons as the Buffs prepare to scale the cliffs in the teeth of the cannister.
" It was hard to abandon the soldiers in the midst of such confusion and danger but it was our duty to get the balloons safely away and stand by for orders. So it was that we hung back over the strait with a bird's eye view of the action. It was hard to see the details through the smoke at times but we could clearly see the savages leaping back down the hill and into the bush and we could see the red coated bodies strewn across the cliff face or limping back towards the boats while yet more men rushed ashore cheering. Suddenly the great gun above the cliff went silent. The surviving Riflemen had done their job! To add spice to the soup we could make out a pirate brig working its way down river, a great gun booming from her bow. The shot was splashing all around the Reuse and occasionally smashing in to her. She had been pointed ashore to lend her gunfire to the landing party but we could see the water churning as she reversed her starboard wheel and spun to meet this new and more deadly threat. Atop the hill a fresh wave of pirates joined the savages and rushed upon the jumble of Tigers and Buffs but a volley or 2 and a loud ringing cheer as the bayonets came down soon sent them all packing. We could see the fort's gun opening up again and watched the redcoats falling back into dead ground. The fort was on the far bank and without the flotilla, there was no way to ferry the troops across. All eyes turned on the duel between the Reuse and the Brig". The 20 year old steamer MacDuff coming into action for the first time since her refit. "It was a tremendous strain to hang in the sky unable to help but while we serve the company rather then her Majesty, we do our duty. Perhaps one day there will be a way for a balloon crew to join in the fight, maybe when Governor Lawrence's steam powered double balloon airship comes into service but that day we could just hang above watching the battle while keeping an eye on the signal flags. It seemed like an eternity that the two ships pounded at each other and we could see that the Reuse was taking a pounding. Why didn't she pull back? But we knew, Her Majesty's navy was not about to give way to a pirate brig. Suddenly we noticed the MacDuff swinging around and pushing up river to join the fight. We couldn't believe it! Her balsa wood hull must be 20 years old and since her recent refit, when her stern wheel was replaced by a new fangled screw, she didn't even carry a gun! All she had was an rocket tube from the landing party. Their gunner know his trade though. The first rocket went a bit wide, as they do, but the second landed plumb amidships and in seconds there were explosions and flames reaching up from her hull. Those lubberly pirates must have left gunpowder and tar and gawd knows what else lying about. In any event we could see them emulating rats as they dove from her decks and this disaster for their cause seems to have taken the starch out of the rest of the enemy. The fighting in the jungle faded away and as a party of Jacks rowed ashore and lowered the boom chain, smoke started to rise from the fort as well." Archive print of the MacDuff when she was first commissioned 20 years ago. So it would appear that our brave soldiers, seamen and air-sailors have smoked that old Black Fox from another lair. Is this the end of him or will he reappear where we least expect him? Is he a Black Fox? or a Black Cat with Nine Lives? While we're waiting: The Setup. Yesterday's game came about as a cross between an urge to get away from all these 20th Century test games and the urge to get a "Colonial" game on table. Now the term "colonial wargaming" has become rather a vague concept these days often including almost anything with exotic locales and asymmetrical warfare though usually set in the 19th or early 20th Century but also being the second home of fictional countries and wars. My Colonial urge was originally to do with my interest in WW1 "sideshows" but the troops aren't ready for any of those campaigns so it is that we find ourselves in 1853 with a expedition of the Red Queen's troops on their way to stamp out another stronghold of the Brethren of the Coast, a collection of freebooters, independence minded Atlantican natives and refugees from the Blue River Rebellion. The setting and the presence of so many singly based miniatures suggested MacDuff to the Frontier for rules, after all this is exactly the sort of game they were initially written for, but logistics and human frailty intervened. That is to say that with my current set up, nearly 1/3 of the table is beyond my easy reach and in order to avoid 1/2 crawling onto the table to lean way across it with sleeve or other body part collecting miscellaneous trees and figures along the way, I often have to resort to using a stick to reach across and push units in the dead zone, This is hard enough with fixed stands let alone groups of individuals, The other complication is that the combination of middle aged short sightedness with my particular type of Astigmatism makes multi-focal glasses near useless and combined with the dim lighting in this room makes it hard for me to read a ruler at arms length. This is one of the reasons I like the grid but an old fashion stick with coloured bands seems to work quite well. Add a dash of nostalgia for the games of the 2009 Game a Week project and a revised older form of Hearts of Tin seemed the way to go. Still working on converting rough notes to readable draft. The Flank Companies rush forward through the jungle to reinforce the Rifles. Usually when I play a solo game I just play both sides to the best of my ability, but every now and then as discussed occasionally over the last 2 years, I feel the urge to "play a game", to feel like "I" am trying to "win", to beat the system if not another player. I haven't settled on a constant method of doing that yet but I was in the mood to give it a go again. I decided to play the attacking force with all the nice toys and let the Brethren be game controlled ambushers. In the past I have used various hidden markers and blanks to add confusion to solo games but I wanted to revisit something I tried in a game on my Gathering of Hosts blog. What I did here was to set out what the total possible defending force would be. Then I assigned certain units as garrison in the fort and as ships's crews and designated others as to where they might show up leaving a few that could be deployed anywhere using the Programmed Pirates scenario rule. Each turn roll 1d6 per invading unit in the bush/jungle where visibility is limited. For each 1 or 2 (or an Infantry signal on a Battlecry die) place a Defender in cover within 3" of an attacking unit. A 6 (or flag) activates a ship. Muskets units will shoot. Sword/spear units will charge. Once deployed I used a combination of the HofT "out of command" roll and on rolling a die to choose between options where there was no obvious best move to control them. Hardly original ideas but they worked damn well! Lets take a closer look at the incident reported in the recent Noodle edition, I had sent a single company of Rifles into the bush to open the chain that stretched across the river. Having had a dry spell on ambushers I should not have been so sanguine (hopeful) as this bit was about to get very sanguine (bloody) (Sorry, had my Browncoat on there for a minute). Their first move was unopposed but they were soon ambushed by some very straight shooting ruffians who were joined by more the next turn. This was looking a little bleak so I rushed the combined flank companies ashore to reinforce them. With only a 1/3rd chance there were already an unlucky number of enemy at hand but the arrival of 2 companies just seemed to egg the dice on and on each of the next 2 turns 2 more units appeared in ambush. It was beginning to look like a well laid trap, especially since there was no room left in front so when the pikemen were put down they had to go on the flank. I still wasn't worried though since the pike guys aren't normally very tough, these guys sure knew where the 5's and 6's were in melee though. Even then it wouldn't have been a disaster if I had remembered that these were the collected Grenadiers with a combat bonus and an extra strength point but oh well, it was confusing with all the brush and the powder smoke. But I need to go help the editor with illustrations for the report on the thrilling, nail biting conclusion of the battle for tommorrow's edition of the Noodle. The first report is in from the historic air and sea expedition against the Black Fox's new lair!
" We were in a small steam launch following the gun boats up the river. With the balloons overhead and air full of the thrum of engines and paddle wheels, the roar of the gunboat's cannon and the hissing trails of the rockets, it was modern war such as never seen in Atlantica. What a marvelous time we live in! We were sure that those ragged pirates and savages would cut and run at the sight of us. A company of the Victoria Rifles had gone ahead to land on the South Bank and release the iron chain that bars passage upriver while the other 2 companies landed by balloon behind the main battery that covered the chain. We were in reserve waiting for the chain to come down when the word came that we were ordered ashore to reinforce the Rifles. We landed on a small beach and rushed forward along a narrow path through dense brush. We could smell powder and hear the roar of musketry and the cries of men but we could barely see 3 inches in that jungle. As we entered a small clearing the edge of the jungle exploded with smoke and fire. Half my men went down before that storm. We had barely shaken out into line with the 2nd company on our left and returned fire when a roaring cheer announced a ragged horde of men with boarding pikes and gawd knows what other medieval tools. We gave them a volley which stopped a few but they cut us to pieces. There was nothing for it but to grab our wounded and head back to the boats. The 2nd company held off the pursuit for a little but then they were nearly surrounded by yet more of the ruffians who had worked their way around and were crumpled in turn. The Jack Tars pulled us aboard and we pulled off just in time. The midshipman in command said that a signal from the Flag had instructed him to take us back, both whole and wounded. As we steamed slowly back out into the strait we could hear the pop pop of the Rifles still in action behind us and see the colours of the Buffs above the enemy battery. The battle was a long way from over but it was over for us."